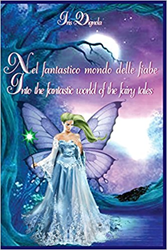 Into the Fantastic World of Fairy Tales: Nel Fantastico Mondo Delle Fiabe by Iris Vignola will enchant audiences young and old in two languages. "Into the Fantastic World of Fairy Tales" is a collection of twelve stories for children with an ancient allure, full of fantasy, taking place in a world inhabited by figures that have always accompanied the dreams of children everywhere: Fairies, Witches, Goblins, Sorcerers, Princes and Princesses. It is an unreal dimension where anything can happen, carrying both children and adults who still love to dream between its bright and fantastic colors, between its spells cast from magic wands and white and magical unicorns with immense wings. Love is at the basis of everything, and good always defeats evil. The first fairy tale “The Veiled Princess” was the theme of the first theatrical performance of “La Maison de la Danse” of La Spezia, Academy founded and directed by Emmanuelle Ricco, daughter of the author. In this third edition, the illustrations were done by the author, in collaboration with Veronica and Irene, her nieces, daughters of her son Maurizio Ricco. Boulevard Books is an educational publishing company founded by author Avi Gvili that aims to publish the newest voices of the 21st century by empowering authors with ownership of their work.